We all need rest - time free from work, fuss and problems. Most people like to get together with family or friends and have a good time in the company of the soul. Especially nice to relax in the fresh air with kebabs. 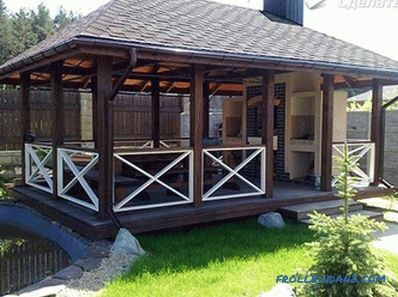 This is the purpose of the gazebo with barbecue or barbecue. 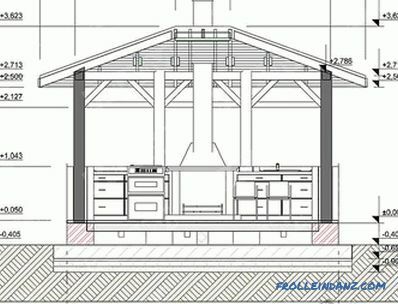 Despite the simple name, this is a rather complicated structure, since the structure must meet the relevant building and fire safety regulations. 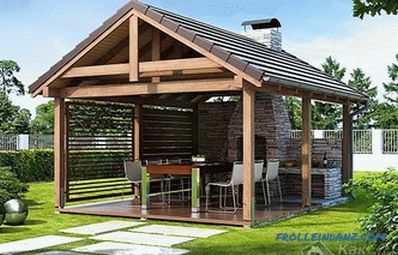 Nevertheless, it is enough to consider all the recommendations, follow the instructions, prepare, and a self-built barbecue gazebo will be an attainable goal for you. And now about everything in more detail. Choose the right place for accommodation. Based on the fire safety standards, the building should be at a safe distance from gas pipelines and power lines. It is also important that trees and dense shrubs that can easily ignite should not grow nearby. And in order not to inconvenience, the distance between the dwelling and the arbor should be such that smoke and soot from the stove do not penetrate the house. The foundation should be a height higher than the level of precipitation, melt water and snow that is characteristic of your area. Otherwise, the operational period of construction will be reduced by several times, as the base and walls will not be protected from water and moisture. 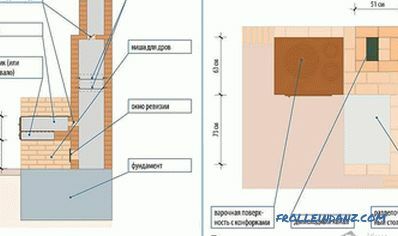 It is necessary to protect from moisture not only the foundation, but also the entire structure of the building. To protect it from precipitation, it is important to make a roof. Another important factor is the comfort of the guests. This not only affects the convenience and comfort of holidaymakers, but also corresponds to the level of fire safety. How, you ask? 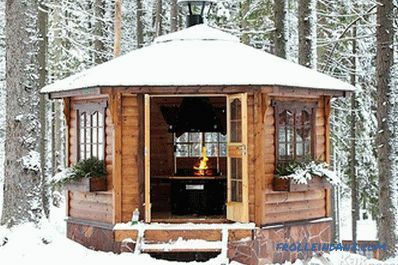 The more spacious and larger the gazebo, the farther people and furniture will be from the open fire. 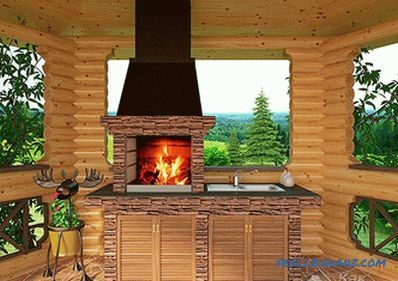 The dimensions should be such that people and furniture are farther than 1 m from the rear and side walls of the furnace and at a distance of at least 3 m from the stove. In order for the moisture that gets inside to not accumulate in it, the floors should be made with a slope of 2-3˚ in the direction from the firebox. Size also affects functionality. 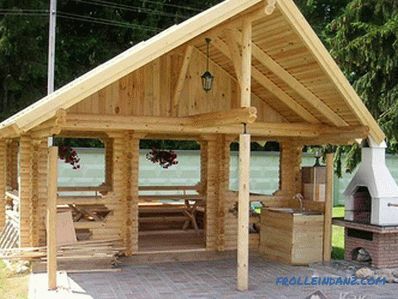 For example, some want to have other equipment, such as a smokehouse, a grill, because a gazebo with barbecue and barbecue can also be built. 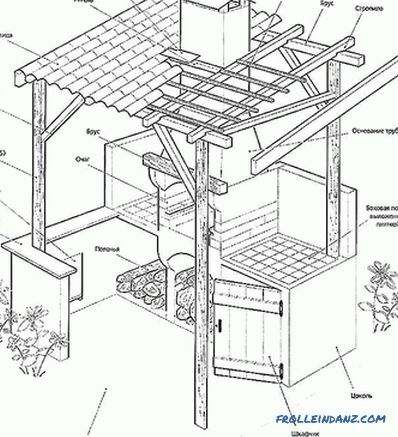 But it should be noted that the dimensions of the structure exert a load on the foundation. The larger the furnace size, the greater the wear. 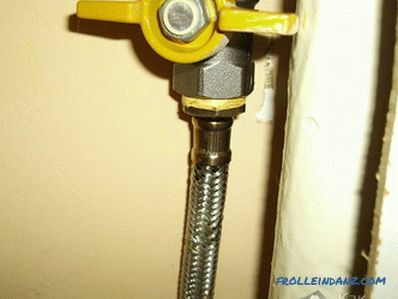 To solve this problem, these elements can be made removable to prevent excess load. If you live in an area with strong winds, you need to take care of a blank wall from the side where the wind often blows. Then stay on air becomes more comfortable. If you take into account these rules, the future construction will last for a long time, will meet all safety standards, and it will be comfortable and pleasant to rest in it. 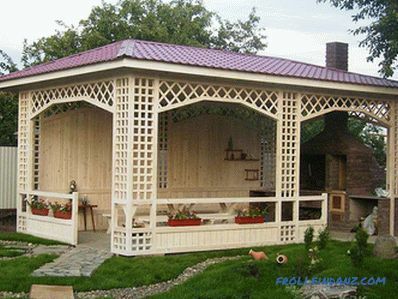 Most often, the arbor is made of brick or stone, since They have a high level of fire resistance and look presentable. It is made of a semi-open type, so that the necessary air exchange and ventilation take place. The floor is laid out from refractory tiles or from other materials that are not exposed to burning. 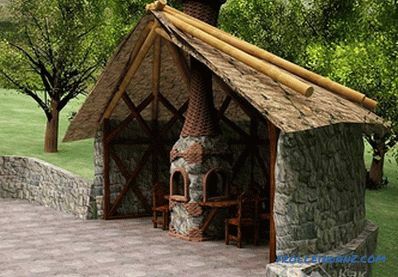 The structure of a wooden bar or log is significantly inferior to a stone structure, since wood can easily catch fire. Yet many make it from this material, as it costs much less. To protect the tree from fire, it is treated with fire retardant, a composition that gives the tree fire resistance. 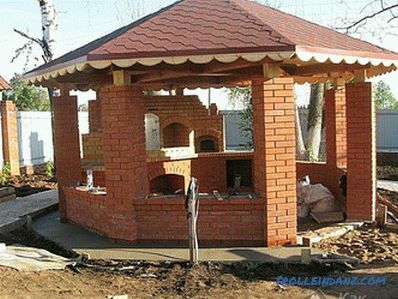 In addition, to protect the material from fire, the barbecue oven itself is not installed in the gazebo, but a little further on the site. Metal constructions are reliable, but they are notable for high prices. To make such a construction is much more difficult. Most often use the combined option to reduce the cost. What to build, the matter of your choice. It all depends on the amount that you have, and desires. Having considered all the details, let's figure out how to make an arbor on your own. So First you need to choose a place where the gazebo will be located. Given the standards, determine the appropriate place and prepare it. If the site has large irregularities, they need to be removed so that the surface is flat. Decide what material you will build from. It must be purchased and delivered to the place of construction. Prepare the necessary tool. To have an idea about the future construction, you need to make drawings to build on them. 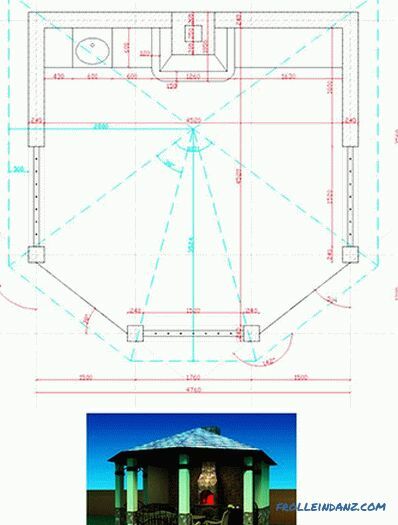 They should indicate the layout, plan of the gazebo, its size and place under the grill. If you can not think it over and fix it on paper yourself, use the ready-made drawings. Thanks to the plan, you will be able to determine the amount of material you need, what tools you will need and estimate how much the construction will cost you. Appearance too plays an important role. Therefore, you must choose a design that fits into the interior of your site. Configurations can be open or closed, rectangular, hexagonal or round, large or small. The choice is yours. Design need to think more when drawing up a plan. Classic style. Its difference is simplicity, clarity of lines and refinement. Traditionally used are concrete, brick, ceramics, glass and natural stone. Country style. The main task - comfort, which is achieved using materials made of wood. 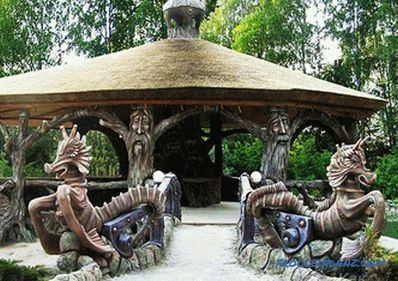 It feels close to nature, and the gazebo can take the form of a cowboy saloon, an Indian wigwam, huts in the woods or a fairy-tale house from a fairy tale. Oriental style. Naturalness, nobility, fragility and indescribable flavor can be conveyed through stone, wood, fabric and glass. 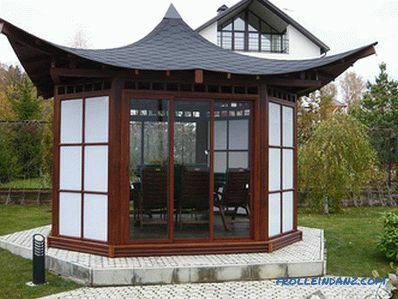 Common examples of this style are buildings in the shape of a Chinese canopy or a Japanese pagoda. Oriental style is determined by the presence of bright colors that should prevail during registration. Ethno style. 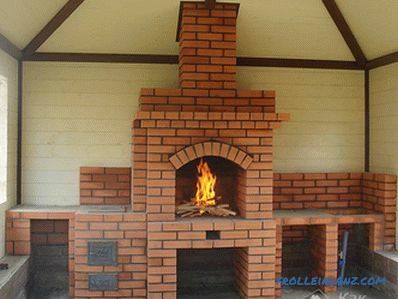 The brutal style of the savage, which can be achieved using raw logs or durable raw branches. 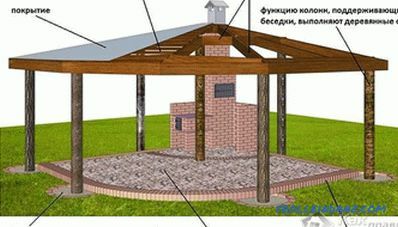 As a result, the gazebo will look like a hermitage hut or a giant bird's nest. 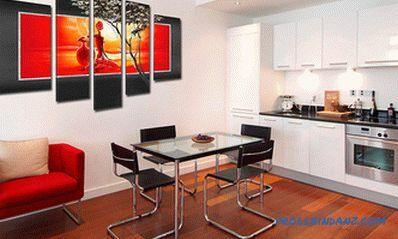 The use of modern styles, such as minimalism, constructivism or modernism. The choice is influenced by your preferences, such styles are not limited to certain forms and materials. You can study photos of various styles and choose the one you like. 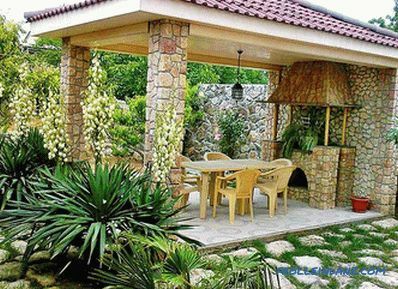 You can decorate your arbor with the help of decorative plants. For example, you can make hanging vases with flowers or braid with decorative ivy. To make the interior homely and beautiful, use various figures and sculptures, original vases and various lamps. If you plan to build a closed type, then inside you can install various interior items, such as a table, upholstered furniture, mirrors and paintings. 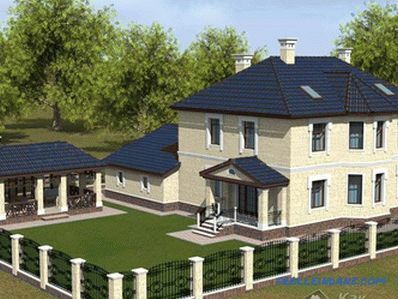 After you have finally decided on the design and layout, you have a plan ready and all the necessary materials have been purchased, you can proceed to construction. you can ask why the foundation for such a building? 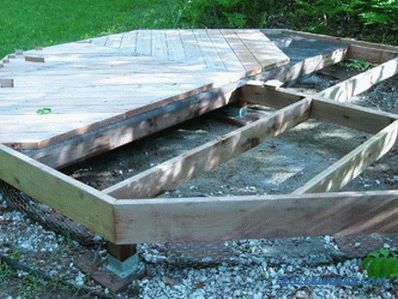 The foundation device can be called a mandatory step, because, despite the simplicity of the design, it can sink a lot without foundation during operation. This is especially true of brick buildings. If the building progresses, the whole building will crack, which will lead to its destruction, and all your labors will sink into oblivion. 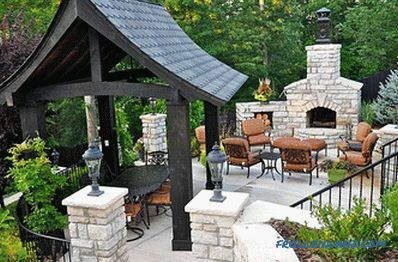 If you want a gazebo to serve you for many years - the foundation is simply necessary. 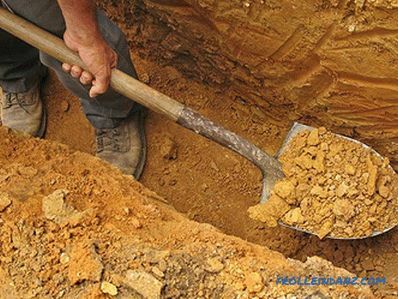 To fill the foundation, it is necessary to remove the top layer of soil so that the soil is dense and there are no tree roots in it. If you are building with bricks, the foundation must be made of fine-depth tape. 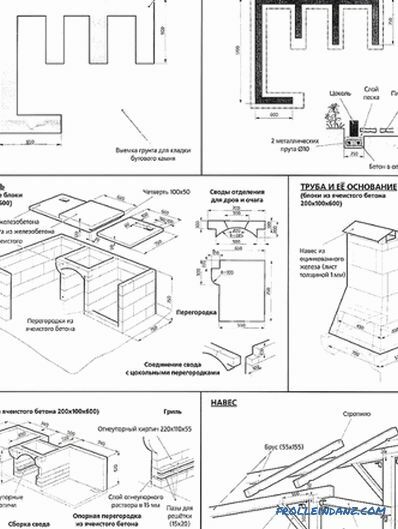 First, take a look at the drawings and transfer the markup to the ground. Adhering to the exact dimensions, drive the stakes into the ground at the corners of the arbor and tie them around the perimeter with a rope. Then on the markup you need to dig a trench. Its depth depends on the density of the soil and ranges from 40 to 80 cm. With this depth, the trench width can be 20-30 cm. All ingredients must be mixed in a ratio of 1: 3: 3 - cement, sand, crushed stone. Water is added until the solution is the desired consistency. Concrete is poured in several layers, ramming it and expelling air. At the end level it with a trowel. To make it as strong as possible, you have to wait a month. During this period, the foundation is covered with polyethylene so that its sediments are not washed away. Before laying the walls, 1-2 layers of roofing material should be laid on the foundation to protect it from precipitation and the scorching sun. The base of the wooden arbor If you decide to make a light wooden structure, you do not need to pour concrete support around the perimeter. Enough at the corners of the gazebo to dig four brick columns. Mark these places and dig 4 holes of 30-40 cm in each. 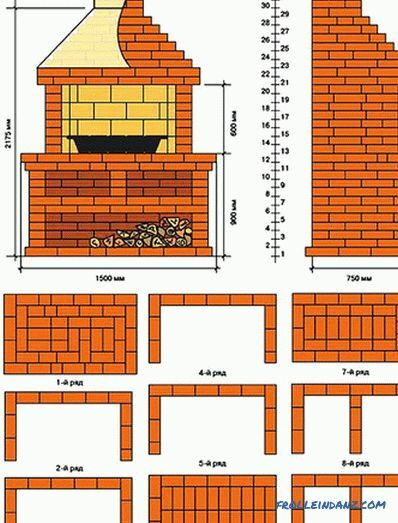 Bricks must be placed in them so that such a column would rise 2-3 bricks above the ground line. Then, after installing the pit fall asleep and tamped. All 4 corners align with the level; they will be equipped with girders under the base. Ruberoid should also be laid on the posts. If such a foundation does not suit you, you can build a pile foundation. But in this case, you will have to find a drill, which will have to make holes in the ground where asbestos pipes will be inserted. The pipes are also leveled and filled with concrete. 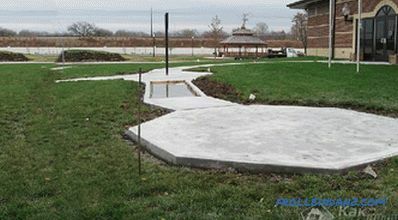 Another base variant is a solid foundation that is completely poured with concrete . This foundation will serve as the floor. It can be covered with tiles to give an aesthetic look. You decide yourself what reason to do, taking into account the material of your arbor. On the foundation (on posts or on concrete) they are laid with beams - thick bars, which are joined using nails or screws. They will serve as a support for the walls and roof. 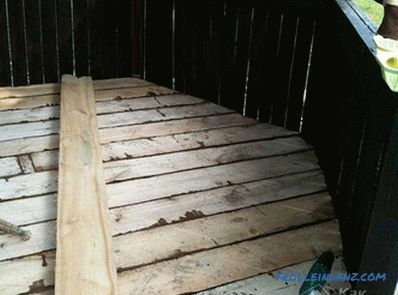 Install wooden logs on the crossbars. You need to start floor finishing after the walls and roof are ready. You can make the floor of planed boards. You can connect them in different ways: a thorn in a groove, a quarter, with the help of dowels. Do not forget about the slope of the place where the stove will be. In order for the wooden floor not to rot, all boards should be treated with an antiseptic. 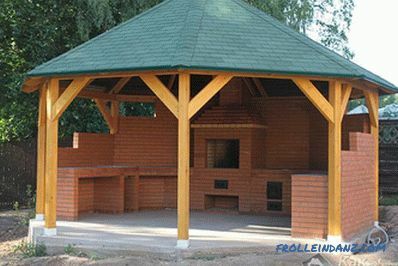 Barbecue oven must be installed on a concrete base, as it weighs a lot. It is necessary to make such a furnace of refractory bricks, and the binder material will be a solution of sand and clay, in proportions of 3: 1. Water is added until the mixture is similar to sour cream in consistency. It is necessary to lay out the stove with the letter "P". Ideally, its height should be up to 1 m. Two lattices of cast iron or hardened steel are mounted on the parallel walls of the furnace during laying. The distance from one grid to another is 20-25 cm. Coals will burn on the bottom grid, and you can cook food on the top grid. A chimney having a conical shape is installed above the grates. 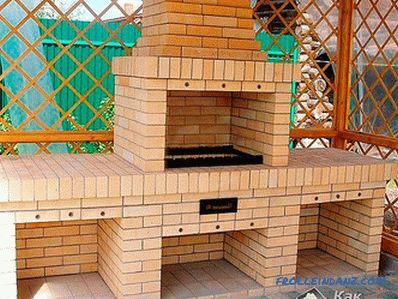 Barbecue stoves, made in the shape of the letter “E”, have a more complex structure. 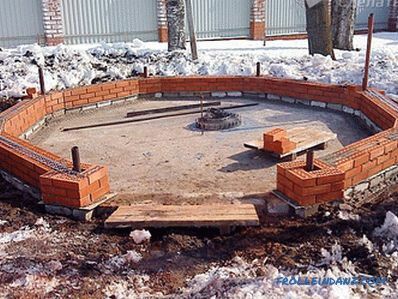 In this case, the lower part will be lined with gas-silicate bricks, and it should be used for storing firewood. The upper part is furnace, made of refractory bricks, according to a familiar principle. There are even more complex and multifunctional designs, which include additional side compartments for kitchen utensils. 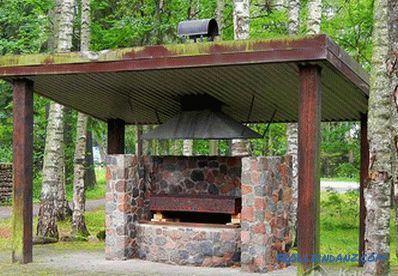 The difference between a barbecue and a grill is that the design includes the back wall, which is not at the grill. It serves as a heat insulator, allowing you to use the heat from the coals more efficiently. 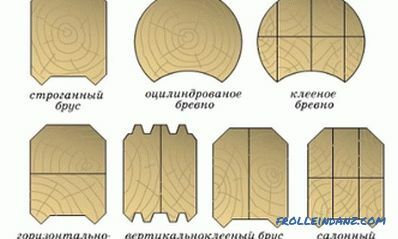 To make such a stove, you need to select its type and see in detail how to put it. Consider the size, a bunch of bricks and other points to make it technically competent. With erection There are also several nuances to the walls, because depending on the design you choose, they may not exist at all. Then it remains to fix the vertical beams at the corners to the base and build a roof. 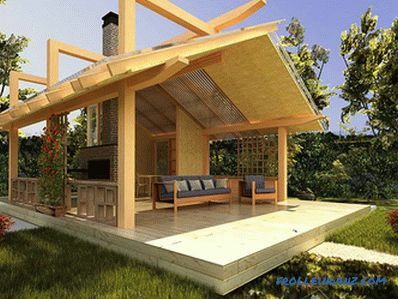 If the arbor has a large size, additionally erect several pillars. Thus, nothing will disturb you from enjoying the view of your manor. Based on the size, a wooden frame is made. The slats are fastened to it at an angle of 45º with the help of self-tapping screws. Excess pieces that go beyond the frame are cut with a hacksaw flush. The slats, which will be mounted on the other side, fit to the size and cut off the ends at a 45º angle. They are fixed on the other side so that a diamond-shaped grid is formed. The upper part of the arbor is sheathed with such gratings. The space between the railing and the floor is sheathed with boards or timber. Walls made of polycarbonate. Inexpensive material that passes sunlight well and saves from the wind. It can be of any color. Grate made of wooden slats. Already mentioned about her. It can easily be made independently from ordinary boards. It looks beautiful and natural. Wooden lining or blockhouse walls. Often with such material sheathed space under the railing. The living wall. If you are an adherent of ethno style and like to relax under the shade, plant grapes, ivy or any other climbing plant that will serve as natural shelter. But to "build" such a wall, time is needed. 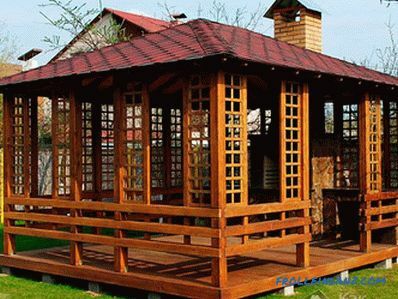 Glazed pergola. This is a closed type of building. This building can be used year-round. In winter, it is useful for storing equipment and other small items. Windows can be made as usual folding, and retractable. A wall of wicker or reed. Such a reed panel will protect you from the wind, but will not prevent the ingress of fresh air. Curtains. The walls of the curtains are used for decorative purposes, imitating the tent. This design is used in oriental style. Walls of stone. The most time consuming walling process. They are usually low and are combined with other options. You can choose one that fits perfectly with your chosen style or suits your chosen goals. 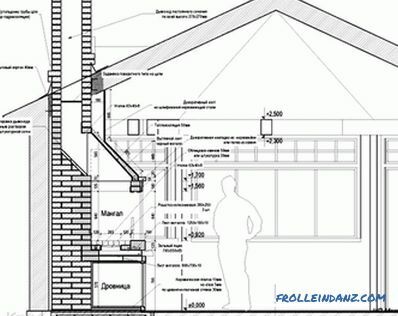 For the roof to be competent it is made, it is necessary to determine the material, calculate its quantity and draw up detailed drawings for the construction of the roof. 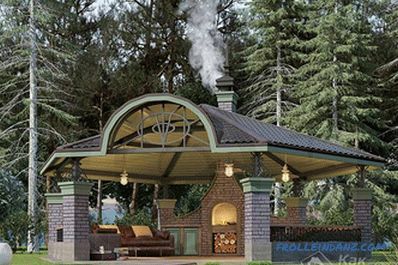 Roof materials should not be flammable, as there is a stove in which a fire is burning in the gazebo. 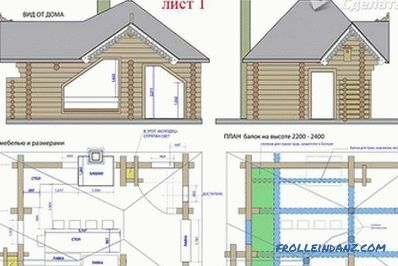 The roof can be made both single-slope and dual-slope. The main load falls on the truss system, which is the main supporting element. Thanks to the crate, the entire load is evenly distributed over all the supporting posts of the gazebo. 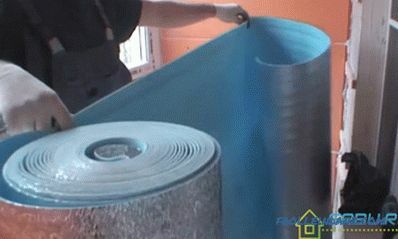 These roofing materials are installed on the finished roof system. Soft roofing materials should be laid on a strong and rigid base, which is made of chipboard or plywood. They can also be laid on a small crate. 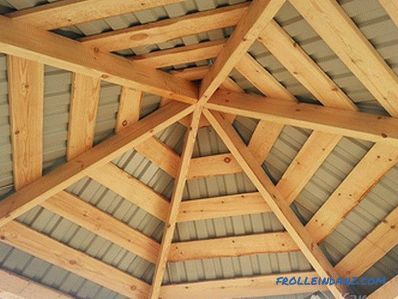 So, to make the roof, it is necessary to equip the roof system of wood and block it with roofing material. This is the final stage of construction. 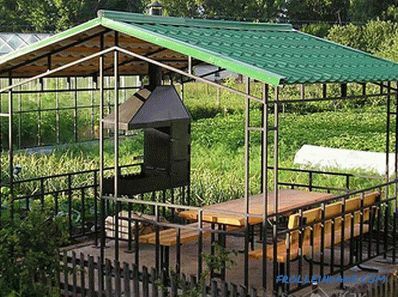 Now you can enjoy relaxation and pleasant socializing with friends and family, preparing a barbecue in your new gazebo, built independently. 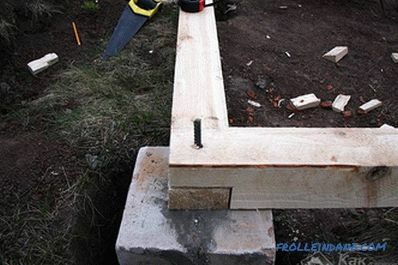 How to make a six-sided arbor. How to make a gazebo from a shaped tube.